Adequate food, water, health care and space are the bare essentials a horse needs to survive. Unfortunately, there are many horses that don’t receive these fundamentals. Although horsekeeping styles may vary, there are key signs that indicate a horse’s basic care is being overlooked. Emaciation is a major cause for concern in horses. Protruding hip bones and clearly visible vertebrae and ribs are evidence that a horse has not been given a sufficient amount of food, and perhaps water, for quite some time. Other red flags include a severe injury that has not been tended to, or excessively long hooves that are beginning to curl upward at the toes. If a horse appears to be only slightly underweight, watch for other indicators that he may be living in a situation of neglect, such as no available food or water and an unhealthy living environment. Essie Rogers, director of education and Health & Welfare programs at the Kentucky Horse Council, says that a poor environment can be classified as neglect if a horse develops health issues as a result of it. “A horse living in mud is not illegal in Kentucky, but a horse living in mud with a significant infection that’s not being tended to properly could be considered failure to provide proper health care,” she says. Under Kentucky law, owners are required to provide adequate food, water, space and health care. A horse that is slightly underweight may look unhealthy, but it doesn’t necessarily mean he is being neglected. Neagle points out that if only a single horse in a herd appears to be thin, it’s likely that he is old or has health issues. However, this may not be true in all situations. “There might be some horses that look pretty good and a couple might look poor,” says Neagle. “You may think, ‘If the other horses look good, then [the owners] must be taking care of the poor ones,’ but that’s not always the case. Rogers says there is really no way to be sure that a horse is being neglected. “If you watch horses deteriorate over time, it’s an indicator that something is going on and perhaps they need intervention,” she says. Rogers explains that there can be differing opinions regarding appropriate standards of care. Although one person may see a horse as being neglected, another person may feel he looks perfectly healthy. If you are worried that a horse is being neglected but are not sure, report the situation to your local animal control officer. If you live in an area where there is no animal control service, contact the sheriff’s office or your local law enforcement agency. Neagle says it is a good idea to follow through with your report to be sure the situation has been investigated and/or resolved. “People just assume that because they’ve reported it, it’s being handled, and we often find that’s not the case,” she says. If you find it difficult to get in touch with the proper authorities, your local horse rescue (if one exists) may be able to offer assistance. “We get a lot of calls for abuse cases, and we ask them if they’ve contacted their local officials. If they say, ‘yes, but nothing has been done,’ we will call on their behalf,” says Neagle. The penalties associated with equine neglect and the outcome for a horse if his owner is convicted will vary by state and district. In Kentucky, if a county is rewarded custody of a horse, it is responsible for that horse’s future. Rogers says a county will usually adopt out a horse locally, surrender him to a rescue facility or send him to a local auction. If you are concerned about a horse’s well-being, don’t hesitate to report it. 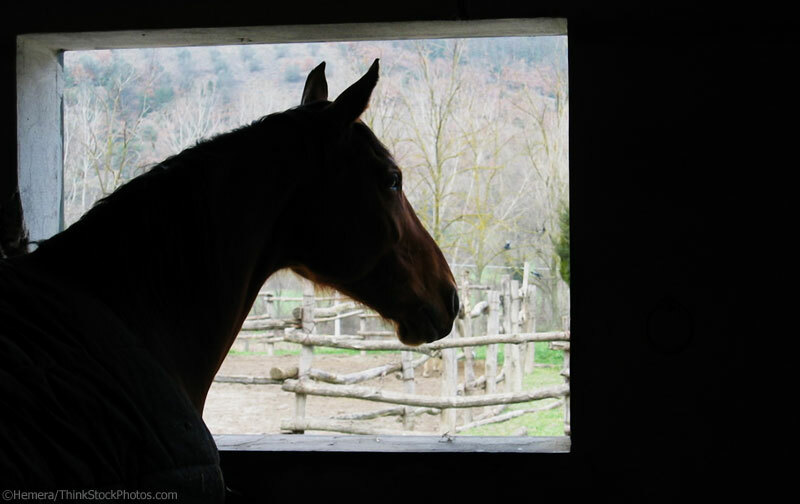 In some cases, the authorities may already be aware of the situation and can tell you if it is being investigated or if the horse has underlying health conditions but is receiving proper care. “Sometimes catching it early and educating the owner may prevent it from becoming a serious case or criminal matter,” says Reiter. Set on 149 acres in Micanopy, Fla., the Horse Protection Association of Florida (HPAF) is a 501(c)(3) non-profit equine rescue that takes in and rehabilitates horses of all breeds that are caught in situations of neglect, abuse or starvation. In an effort to help equines heal, the HPAF keeps them in as natural an environment as possible. “The horses live in group environments on large acreage where they can move and socialize as they would in nature,” says Morgan Silver, executive director of the HPAF. The organization also uses both holistic and traditional health care methods. Each new horse is put on a nutrition plan and is rehabilitated physically and emotionally before going through a retraining program that uses natural horsemanship techniques to prepare him for a new home. This article originally appeared in the June 2009 issue of Horse Illustrated. Click here to subscribe. I will be starting a horse rescue soon, and this is valuble information! Thanks! Good article except that it perpetuates the myth that old age is an excuse for a thin horse. It just isn’t true. With simple measures such as soaking feed, horses 30+ years old can be kept just as round as their younger companions in almost every case. The exception is if a health issue exists – and then the person should be able to show that the horse is under the care of a veterinarian. I experienced another form of neglect when I was boarding out my 3 horses. The property owners were paid to turn my horses out to pasture just during afternoons. No green grass from 5-6pm until noon the next day. They didn’t and 2 out of 3 foundered, badly. I found out later that they didn’t start feeding hay until snow was over the horses knees, regardless of how poor the fields were. Unfortunately there are whakos out there that make a scene when they think a horse is neglected. They don’t take into consideration a recent illness, like strangles, that affect the horse. Those type of idiots should speak to the owner of the horse instead of making false reports. I experienced neglect with my current horse back in 2012. I bought him in Oct 2011 and within 6 months he lost 200 lbs. That was about 1/4 of his body weight. The barn owner was in denial until I had the Vet confirmed what I already knew. There was nothing wrong with my horse he just wasn’t being fed enough. Needless to say I moved away from that barn. Sure enough withing a few months of proper feed he gained back everything he had lost. Thanks so much for this post and sharing this information. I think a lot of people are under the impression that someone else is/will take care of a situation, or that one phone call to the police will make it all better. I wrote a similar story about my own horse who was seized at least twice in his life for starvation according the the rescue. I have no idea what happened to his former owner, but at least he is safe now. I’d love it if you could check out my blog here: http://meganafischer.weebly.com/blog Thanks!! It is great that people are willing to help such beautiful animals! They deserve a good life just like us!